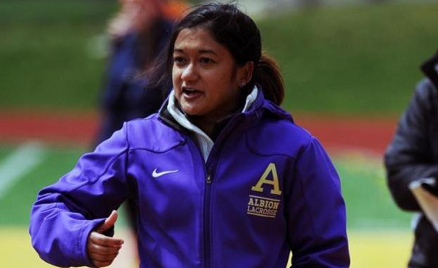 The Albion Women’s Lacrosse coach, Shanta Loecker, has recently been appointed the offensive coordinator of Scotland’s National Team. The Scotland team just finished sixth overall in the last FIL Women’s Lacrosse World Cup this past summer. Scotland will be playing in the next FIL Women’s Lacrosse World Cup coming up in the summer of 2017 where England will be the host nation. Even though the Scottish side has recently hired her, she will continue to serve as the Britons head coach. Coach Loecker sees this hiring as a great opportunity. “I am very excited, and it’s a neat opportunity to work with different coaches,” Loecker said. Scotland has recently been striving for a higher world ranking, primarily hunting down the United States. “The reason Scotland recently hired three American coaches for the first time is because they want to get into that top five ranking,” Loecker said. Receiving the phone call from Scotland’s team was a bit of a surprise for Loecker, but she made sure to let them know that her women’s team on campus is her main concern. “They called me and I knew this was great opportunity, but my biggest thing was that they knew Albion was my first priority,” Locker said. In her second year on the job, Loecker is looking to further progress her Britons side. “My big point of emphasis is that we’re always competing because last year one of our weaknesses was that we slightly lacked a competitive edge,” Loecker said. Last year, the women’s team had an overall record of 5-9 and 2-4 in conference play. To the naked eye, this record isn’t all that impressive, but Loecker remarkably turned the program around. There weren’t many expectations for the Britons because they were in a rebuilding phase. Even though there was a brand new coach and no senior leadership on last year’s team, Loecker wasn’t surprised by their success in reaching their first ever MIAA Tournament. The Michigan Intercollegiate Athletic Association is adding two teams this next spring season, so the Albion women’s team will need to step up their game even more. The MIAA will jump from seven to nine teams in women’s lacrosse. “Our tangible goal for next season is to make the conference tournament, but we are focused on improving on a day-to-day basis,” Locker said. Caio Orofino is a Junior from Ann Arbor, MI currently studying Mass Media Communications and Economics & Management. He is very passionate about soccer and the University of Michigan's football and basketball teams. Follow me on Twitter!